Objective: The objective of this study was to determine the prevalence of dental caries among high school students in Qazvin, Iran. Materials and Methods: Seven hundred and eighty randomly selected high school students participated in this study. There wer 315 (40.38%) boys and 465 (59.62%) girls of the ages of 15 and 16 years. They were examined for dental caries using World Health Organization (WHO) diagnostic criteria. The data were obtained from the epidemiological study of oral health carried out. Results: Of the total sample, only 24.5% were caries free, i.e.,the caries prevalence was 75.5%. The mean DMFT value for the total sample was 2.71 (± 0.86). Male students had a higher mean DMFT value (2.88 ± 0.61) than female students (2.54 ± 0.71) (P > 0.05). The mean DMFT value for the 15-year-old children was 2.66 (± 0.85) and for the 16-year-old children it was 2.76 (± 0.92). No statistically significant difference was found between male and female students. Also, no significant differences were seen. The purpose of present study was to investigate the antibacterial activity of three commercially available fluoride- and zinc-releasing glass ionomer cements on strains of mutans streptococci. 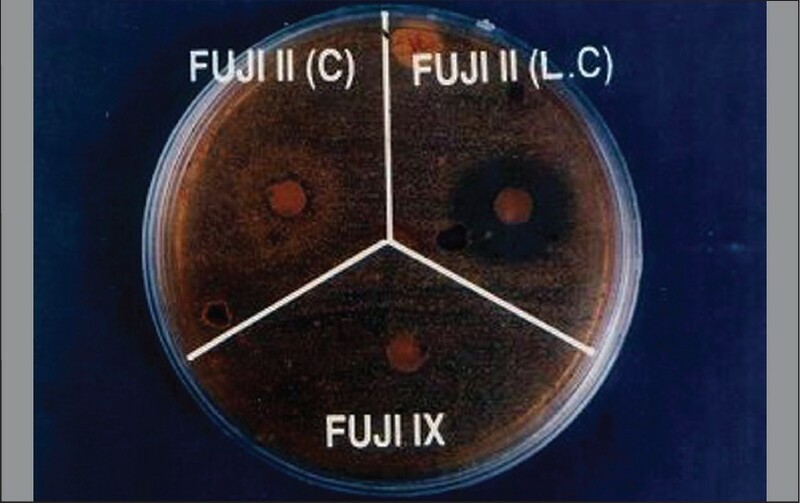 Three glass ionomers (Fuji II Conventional, Fuji II Light Cure, and Fuji IX) were used. The antibacterial effect of glass ionomer cements were estimated by anaerobically growing mutans streptococci on a selective medium by inoculating human saliva and measuring the inhibition zones around the glass ionomer discs on the medium. Fluoride and zinc release were measured and compared with the antibacterial activity. The results, when statistically analyzed, showed a direct correlation between fluoride release and antibacterial activity, but there was no correlation between zinc release and antibacterial activity. Aims: The purpose of this study was to evaluate and compare the sealing ability and the thermal insulating capability of four different cavity lining materials. 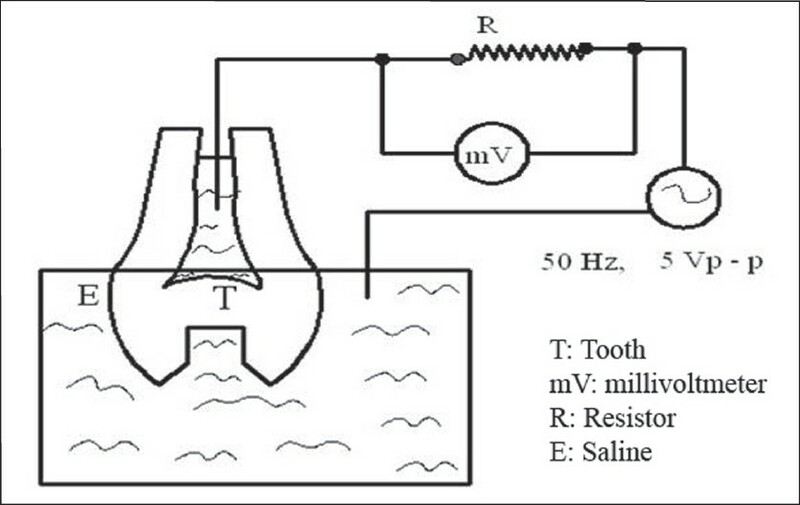 Materials and Methods: Forty noncarious human mandibular second premolars that were extracted for orthodontic treatment were collected, cleaned, and stored in distilled water. These premolars were randomly divided into four groups of ten teeth each for treatment with the different cavity lining materials. Group I teeth were treated with cavity varnish, group II teeth with amorphous calcium phosphate (ACP), group III teeth with dentin bonding agent, and group IV teeth with resin-modified glass ionomer cement (RMGIC). Electrical resistance and the difference in the time-temperature curve of the external surface and the pulp side [A D -A P ] of each tooth following heat and cold application for 120 s were measured before and after cavity lining placement to determine the sealing ability and thermal insulating property, respectively. Data collected were subjected to statistical analysis. For paired data, paired t-test and Wilcoxon's signed rank test were used. 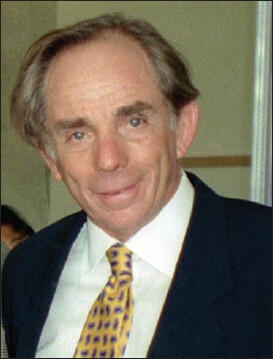 One-way ANOVA was used for comparisons between multiple groups and the Mann-Whitney U test for comparisons between pairs. Results: The mean difference in electrical resistance (in KΩ) of different cavity lining materials were as follows: group I = +3.53, group II = −1.00, group III = +20.43, and group IV = +11.44. The mean differences in the area (A D -A P ) under the time-temperature curve following heat application were as follows: group I = 6.6 mm 2 , group II = 15.3 mm 2 , group III = 130.5 mm 2 , and group IV = 412.0 mm 2 . The mean differences in the area (A D -A P ) under the time-temperature curve following cold application were as follows: group I = 24.5 mm 2 , group II = 3.2 mm 2 , group III = 314.9 mm 2 , and group IV = 480.5 mm 2 . Conclusion: Dentin bonding agent and RMGIC provided effective sealing of the dentinal tubules and significant thermal insulation when compared to the other tested cavity lining materials. Objectives: The aim of the study was to assess the common chief complaints of the Indian children and the average age group at which they report for in their first dental visit. 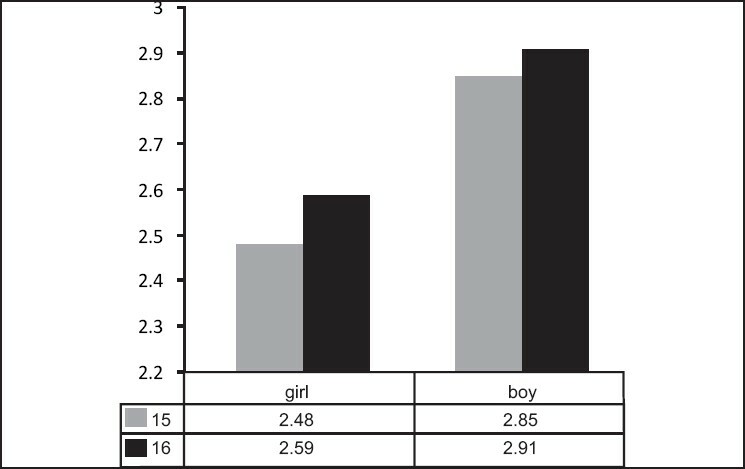 Materials and Methods: A retrospective study was carried out using the case records of 716 children who reported to the postgraduate section of Department of Pediatric dentistry, Meenakshi Ammal Dental College, Chennai, in 2007. The age groups of the children were divided into three categories 0-3 years, 3-6 years and 6-12 years. The various chief complaints were categorised as follows, Orientation to prevention, Routine visit, Deposits / Discoloration, Habits, Unerupted / Missing or Extra Tooth, Pain, Dental caries, Malocclusion, Trauma, others. The average age group and most common complaint at the first dental visit was assessed. A prospective study was done in January 2008, were 215 children were screened. The assessment was made as explained above. Results: Retrospective study Maximum number of children who reported for their first dental visit was between 6-12 years (59.08%). Most common chief complaint for the visit was pain (42.04%). Second common complaint being dental caries (28.49%). Prospective study Maximum number of children who reported for their first dental visit was between 6-12 years (69.77%). 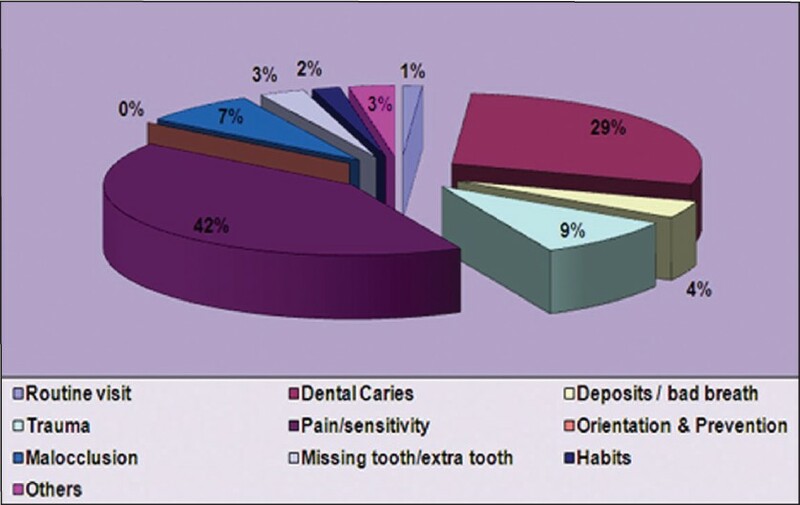 Most common chief complaint was dental caries (34.88%). Second common complaint being pain (27.91%). Conclusion: Children report for the first dental visit most commonly only after 6 years and for complaints like pain and dental caries. 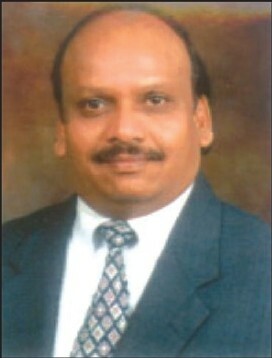 Orientation to prevention is not considered and preventive dentistry is yet to reach the common population in India. Dens invaginatus is a developmental malformation of teeth, probably resulting from an infolding of the papilla during tooth development. 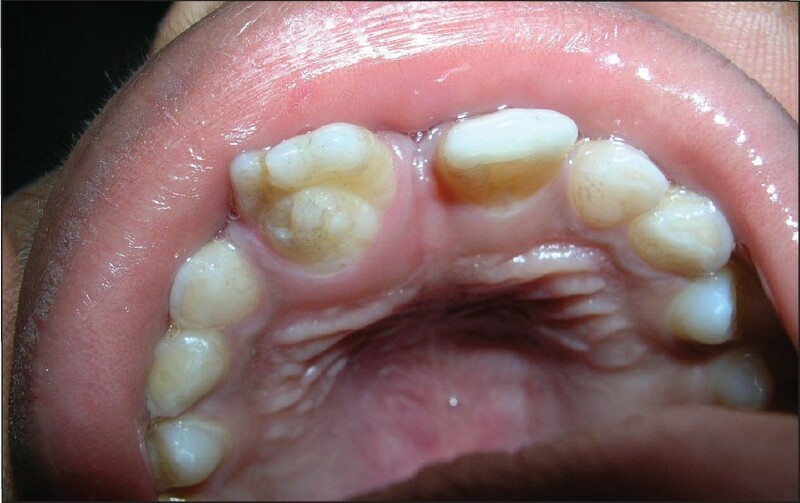 It predisposes the tooth to develop caries and periapical pathosis. Root canal therapy may present many problems because of the complex anatomy of the teeth. The purpose of this case report is to describe the endodontic treatment of an Oehlers type III dens invaginatus that perforated into the apical area. Calcium hydroxide powder mixed with normal saline, was used as an intracanal medicament. This eradicated the pathogenic microorganisms in the invagination and preserved the vitality of the tooth, allowing gutta-percha obturation in the invagination. Cutaneous sinus tract of dental origin is the commonest of the many types of sinus tracts that are formed on the face and neck. 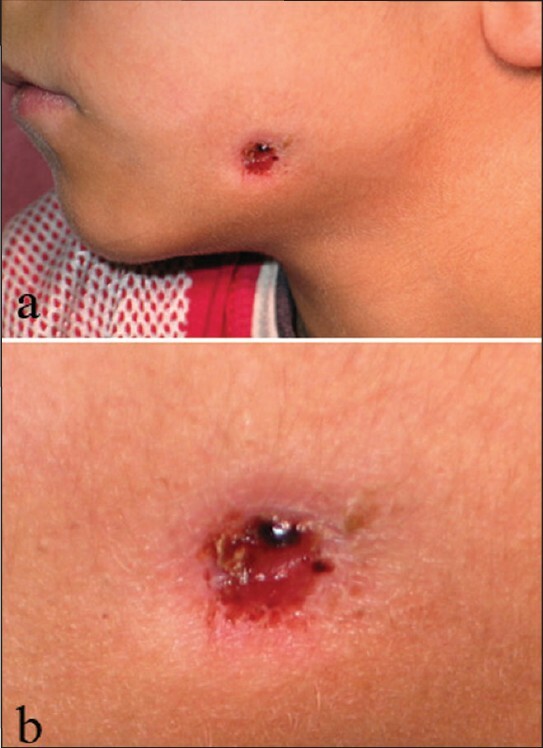 Cutaneous sinus tracts may originate from local chronic osteomyelitis (Garre's osteomyelitis). Although the etiological factor is usually periapical infection, they are seldom of periodontal origin. Conventional periapical and panoramic roentgenograms are generally insufficient for diagnosis and treatment planning of cutaneous sinus tracts of periodontal origin. In the present case, computed tomography was used for diagnosis, and osteomyelitis was managed by periodontal treatment. 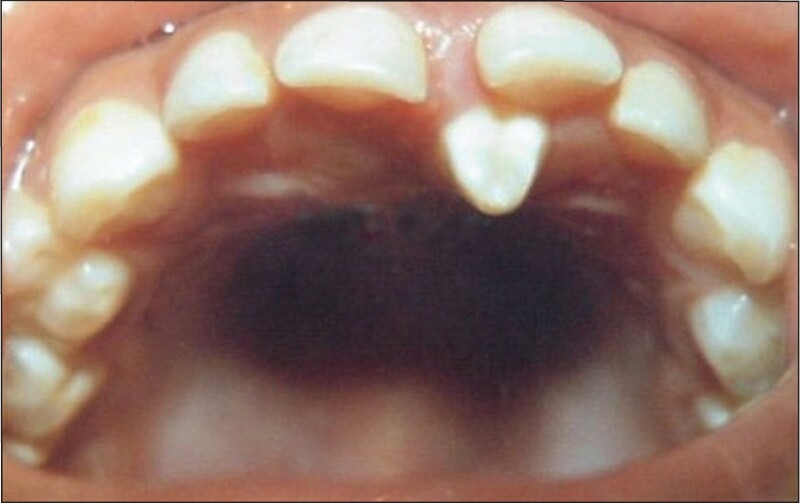 Concomitant hypodontia and hyperdontia is a rare condition of unknown etiology. 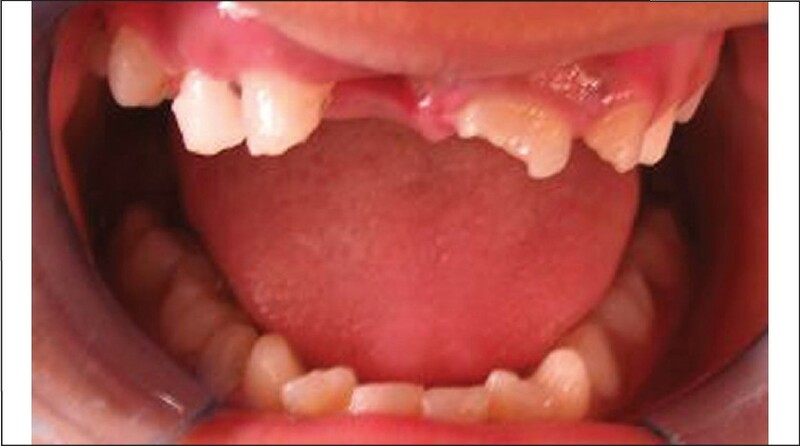 One such case of occurring in identical twins in mixed dentition is presented and discussed. A sibling, especially a twin of an affected patient, should be suspected of having a similar problem, even if he or she is asymptomatic. Genetic factors probably play an important etiological role in the co-occurence of partial anodontia and supernumerary teeth. Intrusion of immature permanent anterior teeth presents a great dilemma due to variety of treatment options. The ideal treatment option is the one with least probability of developing complications like external root resorption, obliteration of pulp canal, marginal bone loss etc. This paper presents a case report with treatment strategy of repositioning, splinting, successfully attempted apexification and obturation of a completely intruded immature permanent central incisor. Excellent healing with no post-operative complications even after 10 months of follow up.